Run by a musician for musicians. Albamusick deals in secondhand and antiquarian sheet music of all types together with related books. This vast collection of classical music, probably the largest in Britain, includes much of the standard repertoire and many items that are now out of print. Our customers come from all over the world and include famous musicians; some of the extensive stock is available for you to browse when you visit Glasgow. A few less common items are listed in the on-line catalogue. We aim to have as much as possible of the standard repertoire for all instruments available in the shop at bargain prices. We are always looking for collections of rare and out of print music, particularly the items listed on the ‘Wants’ page. If you have music you no longer require please let us know. These pages also include information about the early music ensemble Banquet of Musick and instrument hire and tuning. The main shop is in Glasgow about a mile west of George Square and close to the University and Kelvin Art Gallery and Museum. 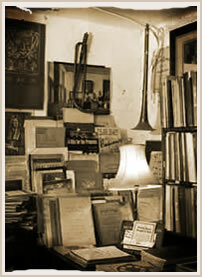 Albamusick now manages the music section of 'Edinburgh Books', West Port Edinburgh which is near the Usher Hall. Please make all enquiries and requests to the main shop in Glasgow by . The proprietor will be pleased to meet you outwith these times by arrangement, and even during normal hours it is best to let him know when you intend to call as he is often away from the shop.